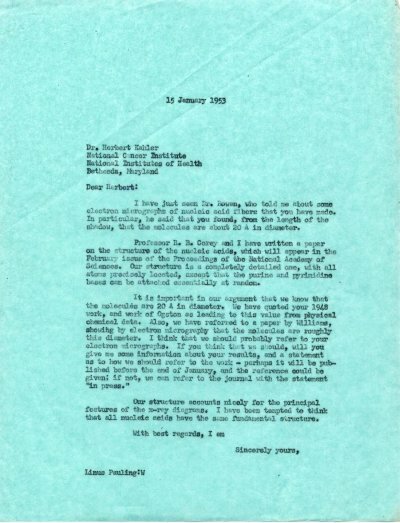 Letter from Charles W. Tucker, Jr. to LP RE: sends LP a copy of a manuscript he is submitting for publication on the crystal structure of beta-uranium. Asks LP to pass it on to Dr. Bergman as well. [Letter of response from LP to Dr. Tucker, Jr. January 22, 1953] [Filed under LP Correspondence: Box #410, Folder #18]. Letter from LP to Dr. G. E. Burch RE: says that he shall try to arrange for Dr. Itano to go see him and has just submitted a letter to the Commanding General of the Fourth Army regarding Dr. Coppedge's deferment. Says that he is currently working on the preparation of a second edition of the textbook General Chemistry. [Letter from Dr. Burch January 12, 1953, letter of response from Dr. Burch January 19, 1953] [Filed under LP Correspondence: Box #33, Folder #8].